What happens when you take gangsters, robbers, supernatural, a train called “Flying Pussyfoot”, and mix it with the 1930’s? Well you get the fun ride known as Baccano! Baccano! is a sixteen episode Action/Comedy anime based on the light novel by Ryohgo Narita and published by Media Works. The anime is from Brain’s Base Studio and was dubbed by Funmation. It originally aired from July to November of 2007. Each of the stories in the series involves several unrelated plots intersecting and crossing each other as events spiral farther and farther out of control. Immortal alchemists, mafia operated speakeasies, and many other elements of pulp fiction mashed together for a world straight out of the movies (Anime News Network). The style and animation is simply amazing! A lot of times when you have an Eastern culture try to depict American history, it comes out completely wrong. With Baccano!, the artists really did their homework and were able to create exactly what we would come to imagine from the 1930s. The art is perfect, the music is appropriate, and even the characters are amazing. The animation isn’t 100% top notch, but, honestly, I didn’t really care because I was just so interested in the story itself. After the 12th episode, it kinda loses interest a little. Most of it take place after the Flying Pussyfoot incident, and mostly revolving around Chane and her sudden romance with Claire Stainfield; which, by the way, comes out of no where. Does it work, sure. But does it make it interesting, not really. Also, fair warning, there is a good amount of blood and gore in the series; from torture to cut fingers. Thankfully, it’s not used excessively, unlike some anime's use of fan service *cough* High School of the Dead. Now, I should mention a couple parts involving the main characters of this series. In the first episode, they take about twelve minutes to introduce the characters you have to keep an eye out for. This is done by a couple members from the Daily Days, information brokers who will come up several times in the series. The second way you know about the main characters in the show is the opening theme. It’s not only catchy, but it tells you the characters the story revolves around, and also points out certain moments that will be relevant in the upcoming episode; so you can’t skip it. In order of the opening there’s Isaac, Miria, Firo, Maiza, Keith, Berga, Luck, Sziland, Ennis, Lua, Ladd, Chane, Nice, Jacuzi, Eve, Dallas, and Czeslaw. And on that note, the characters are just amazing! Wether they’re gangsters, French, or just goofy robbers, all the main characters are fun to watch. I can’t really say if there’s any development, but it’s mostly cause of how the story is told. There are some parts that aren’t really talked about, like the romance between Firo and Ennis, but it doesn’t effect the show in a really bad way. Again, Baccano!’s real purpose is the complex story it gives. As for favorite characters, it’s a toss up between Ladd Russo and the duo of Isaac and Miria. Ladd for his insane killing obsession, coupled with the pure joy he gets out of it; and Isaac and Miria for their bumbling, light hearted comic relief. While watching the English dub of Baccano!, I came to a very big conclusion. This is the best anime dub I have ever heard! The casting choices from FUNimation are the best I’ve ever seen them do. And, when you really think about it, they’re not just voicing regular people, but immigrants, gangsters, and crazy people. Some of the accents are a bit forced, but it doesn’t hurt the series too much. There’s also a good mix of veterans and new voice actors. Veterans such as Caitlin Glass (Black Cat), Colleen Clinkenbeard (Full Metal Alchemist), Jason Liebrecht (Eden of the East), Monica Rial (High School of the Dead), Todd Haberkorn (xxxHolic), and Carrie Savage (Paranoia Agent). As for the newbies, you have Bryan Massey as Ladd Russo, Joel McDonald as Jacuzzi Splot, and Maxey Whitehead as Czeslaw Meyer. I’m hoping to hear more from these newbies in the future! 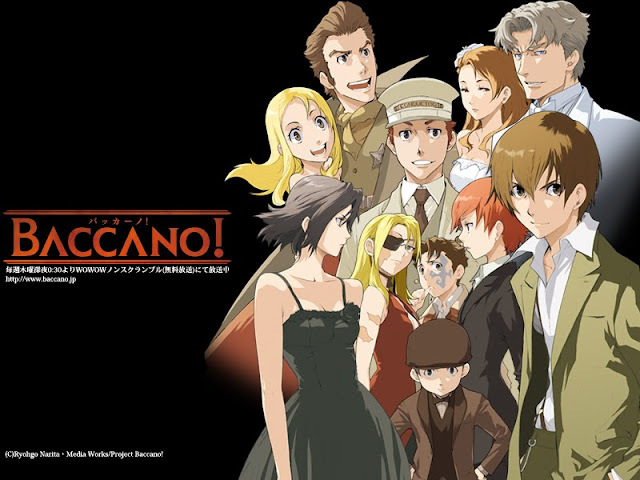 All in all, Baccano! is an exciting ride during the 30’s with a few added twists to keep the plot interesting. The characters are fun to watch, even bad guys like Ladd Russo, and the time period is portrayed perfectly. Once you get past the jumbled up story line and the gore, it’s a fun anime to watch and I highly recommend it. Baccano is indeed an easily recommendable anime. It may not have deep philosophical insights and whatnots, but it sure knows how to entertain its audience. It's the kind that doesn't take itself too seriously -- for the better. The characters are indeed fun to watch, particularly Isaac and Miria. I don't know. They just have a very charismatic aura. Honestly, I didn't find the storytelling confusing. The story weaves itself naturally. (But I do understand how it could be confusing for some). I think the last episodes are OVAs though. I don't really remember, but I think the original series is up to episode 13. That might explain why you start losing interest. I just discovered your blog (randomly searching for blogs in google) and followed it. Hope we can connect! Awesome!!!!! Thanks for following me!!! !